Trunking, Bonding, Aggregation; What Does it Mean? Over the generations, Ethernet bandwidths have increased from 10 Mbps (Million bits per second) to 10,000 Mbps. 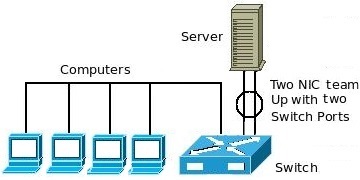 Each port on a network switch would be connected to one network device, such as a computer. But to connect a server you need higher bandwidth. For this purpose you could combine multiple Ethernet channels into one. This process of combining multiple Ethernet channels into one is called port trunking, Ethernet bonding, or link aggregation. Each of these terms refers to exactly the same thing and there are several other terms that are occasionally used. Some Ethernet switches support combining two switch ports to combine their bandwidth into a single link. Both the Linux and Windows operating system support link aggregation. This is achieved by installing multiple NICs (Network Interface Card) in a system and configuring a built-in bonding driver.